If you want to become a welder in New Jersey, you should know that there is a bunch of schools where you can get your training. In this article, you can find the list of the best welding schools in New Jersey including their addresses and contacts. Also, there is some additional useful info for future welders. 3 Where Can Certified Welders Work in New Jersey? Before choosing a future career, of course, it’s important to understand what salary you’ll be earning. Speaking of welders in New Jersey, their median salary is about $47 310 per year. It’s slightly more than a median salary throughout the country which is about $39 390. At the same time, the top 10% of welders in New Jersey earn about $69 530 annually why the top 10% of welders throughout the USA earn $62 100 per year. In simple words, welding is a process of joining metal pieces. To complete this process, welders need to use a variety of tools that heat and melt metal. Of course, there are lots of responsibilities that welders perform. Studying and understanding specific sketches, blueprints, and instructions. Also, a welder should be able to follow all these instructions properly. Raw structure/material analysis in order to determine appropriate methods required for an excellent result. There are about 100 welding methods such as gas tungsten arc welding, shielded metal arc welding, or gas metal arc welding. Usage of appropriate tools depending on the chosen method. Maintaining equipment and tools so it meets all the requirements. There is a variety of different types of tools including electric and manual equipment. Sometimes, welders should be able to use numerous combination of tools to perform their job properly. Where Can Certified Welders Work in New Jersey? Auto & motorcycle fabrication and repair. As soon as you get more experience, you’ll be able to find a bunch of amazing job offers. 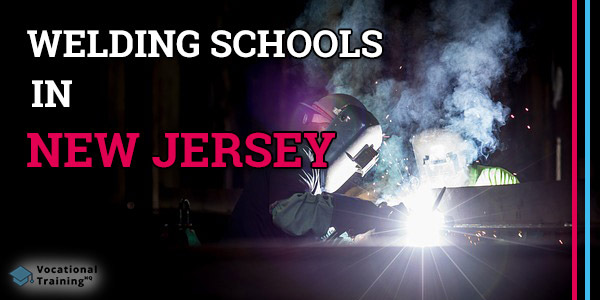 In New Jersey, there are 27 schools that provide welding certification programs. Each school is approved by the American Welding Society’s SENSE Accreditation Program and provide such classes as Gas Tungsten Arc Welding (TIG), Shielded Metal Arc Welding (stick), or Gas Metal Arc Welding (MIG). Keep in mind that the information in the table may change so we recommend you to doublecheck it. If you want to participate in a welding training program, you need to meet some requirements. First of all, you need to have your high-school diploma or GED. Consider that some schools are ready to accept high-school juniors. As soon as you finish your training, you’ll be obliged to pass a standard test to prove your qualification. There is only one underwater welding school in New Jersey. It’s Divers Academy International which is located in the city of Erial. The school has absolutely great facilities and provides a number of training programs for commercial divers. As you see, there is plenty of opportunities to get your training and start a successful welding career. Just make your choice and enroll in the program you like most of all.